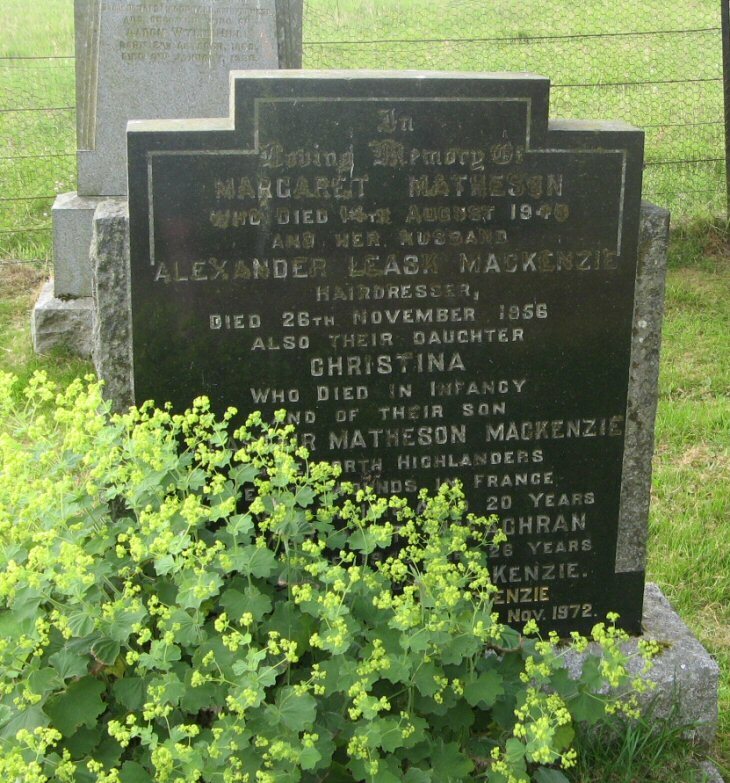 In/loving memory of/MARGARET MATHESON/who died 14th August 1948/and her husband/ALEXANDER LEASK MACKENZIE/hairdresser, died 26th November 1956/and their daughter/CHRISTINA/who died in infancy/and of their son/Sgt. ALASTAIR MATHESON MACKENZIE/died of wounds in France/2nd November 1918 aged 20 years/also MARGARET McEACHRAN/died 11th June 1945 aged 26 years/wife of RODERICK MACKENZIE/also HUGH GORDON MACKENZIE/died in Rio Gallegos Argentina 8th Nov. 1972. Picture Added on 11 July 2010. Mackenzie, Alastair, Lance Serjeant 200203 02/11/1918 aged 20, 1st/4th Bn. Seaforth Highlanders, son of Alexander L. & Margaret Mackenzie, of Monte Vista, Dingwall. Enlisted in Aug., 1914. I. B. 31. Cambrai East Military Cemetery. Added by Vernon on 26 August 2011.